Comm Eye Health Vol. 28 No. 91 2015 pp 59. Published online 08 January 2016. A 65-year-old man suffered an injury to the right eye, caused by a stone which ricocheted while using a weed cutter in his garden at home. He had not been wearing eye protection. At initial assessment when he presented to the hospital 17 hours following the injury, his visual acuity was nil perception of light (NPL). He had a corneal perforation and early signs of endophthalmitis, including mucopurulent discharge and anterior uveitis, were already present. A CT scan showed no intraocular foreign body. Answer the questions and then compare them with how the team approached the situation. See article on page 44. 1 What is the raw score? 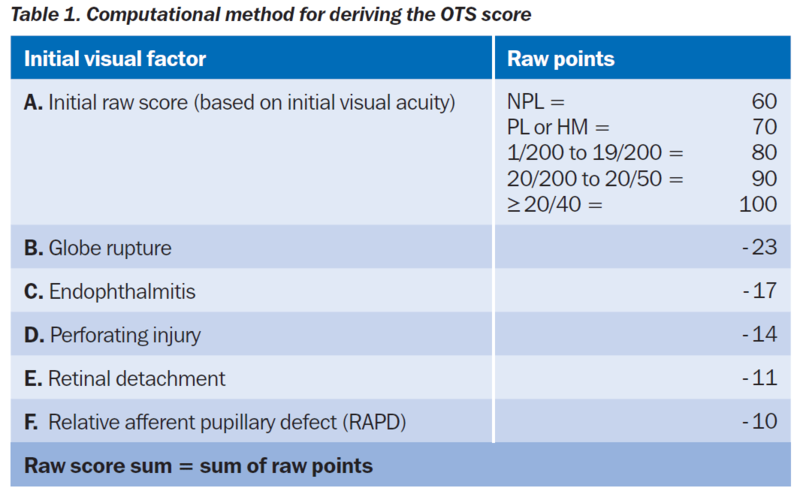 2 What is the ocular trauma score (OTS)? 3 What would you say to the patient and his family? 4 How would you treat the patient? 5 What is the likely clinical and visual outcome if the infection cannot be controlled?